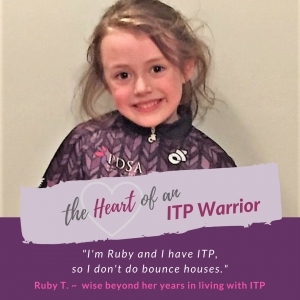 “I’m Ruby and I have ITP, so I don’t do bounce houses.” A profound statement from a 3-year-old little girl from Lincoln, Nebraska well-versed in low platelet safety guidelines. Diagnosed at only 15 months of age, little Ruby has never set foot in the bouncing habitat headlining at most “kid-friendly” parties and events, but a bounce house isn’t exactly “kid-friendly” when your platelet count is below 20. “Ruby is a rollercoaster,” said her mom, Jill. Her counts fluctuate from highs to lows – at times dropping rapidly to dangerous levels. As athletes, Ruby’s parents Matt and Jill recognize the power of positive thinking. Grateful for the highs and that IVIG brings her counts back up, Jill reflected, “nothing is as dark as the day I sat in the doctor’s office and thought my daughter had cancer.” Inspired by the actions of a colleague who shared with Matt his personal journey with IVIG treatments to help them better understand Ruby’s journey, the couple developed a deeper respect for raising public awareness, the significance of support and the duty pay it forward. “We would be lost without our healthcare providers and friends. They are the constant voice that supports us,” said Jill. To honor their dedicated clinicians, laboratory professionals and healthcare staff, and devoted to celebrating the power of purple, Jill and Ruby (donned in purple of course!) began delivering purple treats and posting purple pics and facts on social media about ITP during Awareness Month. Acts that fueled enthusiasm for a movement that would eventually penetrate an entire community. A fellow cyclist of Matt’s, Skip approached the couple with an idea to help promote awareness and support PDSA. Skip organized a fundraiser, designing and selling a cycling kit featuring a woman warrior (representing Ruby) and the PDSA logo, an effort that became the catalyst in launching the #FastRuby movement! Due to an overwhelming response and request from the community, the movement grew to include #FastRuby t-shirts that were also sold and racing tanks that would become the uniform for the #FastRuby team of Jill’s “Mommy friends” running a local 80-mile relay race. The team running with a cause to raise awareness for ITP that passed every other team and made it to Lincoln first. Jill contacted a local brewery that gladly opened their doors as a t-shirt pick-up location and a place for an Awareness Month celebration and her mom contacted the local media producing a story about ITP! Their mission was based on a simple question: “How can we get the word out about ITP?” and the more people that heard about their mission, the bigger their movement became. Strangers stopped them to ask the meaning of their t-shirts, ITPers contacted them after reading their story and the men’s team smoked by the #FastRuby team of Mommy friends wanted to know how they could buy a shirt and support the cause. No surprise really, that this tiny ITP Warrior could incite such velocity into a movement all started because of her. Especially when she’s wearing her #FastRuby t-shirt. The shirt that wise, little Ruby calls her “GO AWAY ITP!” shirt. Isn’t that what we all want…for ITP to just go away? While Ruby still experiences dips in counts here and there, she has managed to avoid treatment. And for this family, that is something to celebrate.